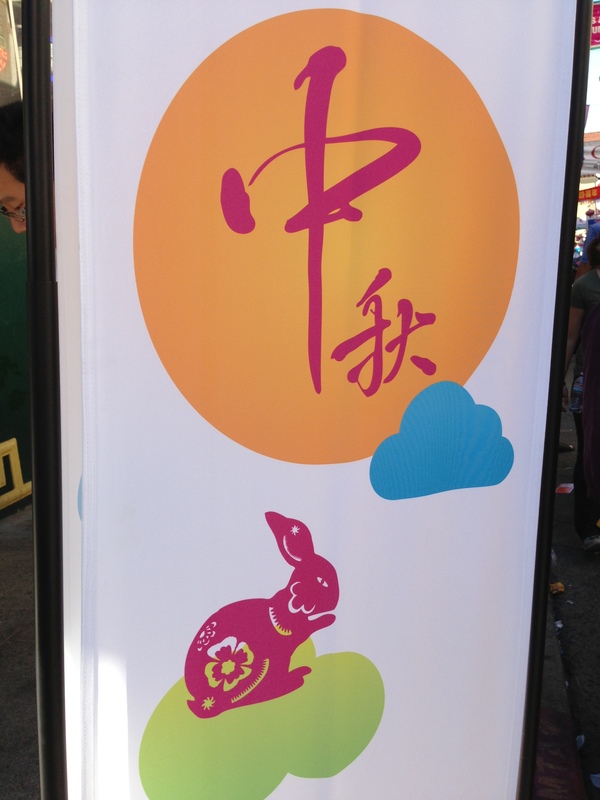 Mid-autumn Festival is almost here, most of Chinese/Taiwanese/HK blogs are either about festival itself or mooncakes. And I won’t be different so yes, ANOTHER post like that. I noticed many people think we live in HK, so just to make it clear: my husband works in California, USA and that’s the place we live in for now, hopefully we will get a chance to come back home (a.k.a. ‘Good smell harbor’). My husband was abroad studying for so many years missing all the important to Chinese culture days that he doesn’t really care much anymore. And here’s ME – Pretty Soldier Sailor Moon. Or just a wife who tries to keep both of our cultures and traditions alive. 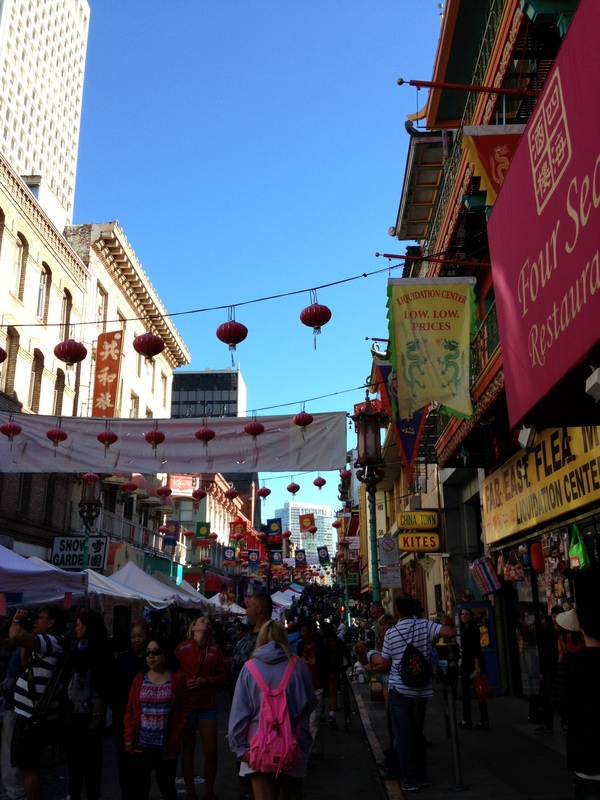 We have no relatives here and his friends don’t really care as well that’s why for 2 days I had to make upset face to force my husband to not go work overtime and see Aut umn Moon Festival that happened this weekend in San Francisco’s Chinatown. Me, as a festival freshman, just run there doing bunch of photos and buying quite useless stuff. 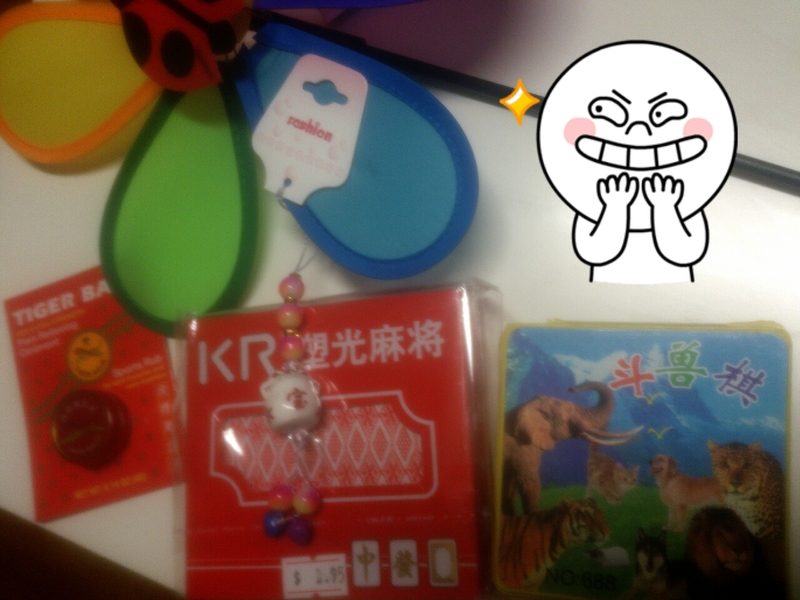 Let your wife go to any gift shop and she will end up with a tiny tiger balm, mahjong cards (broken table mahjong), phone charm, animal chess (be sure you make up the rules later so your wife will keep losing and hating you for the rest of the night) and a colorful fan. ‘Because it was cheap’. Probably that’s why they have all kinds of banks there. What’s my impression of Chinatown? Too Chinese. You may ask me ‘WTF?! It’s CHINAtown’. It made me feel like those fake Chinese restaurants where people put as many things connected to China to hide how fake-chinese food they got. Maybe I’m just too young and see too little traditional places but making BANKS look like a temple or just old style building? Not my cup of tea. Beside that I was so happy to be in that crowded loud place where people throw firecrackers on the ground and yell, ekhm, talk to each other. 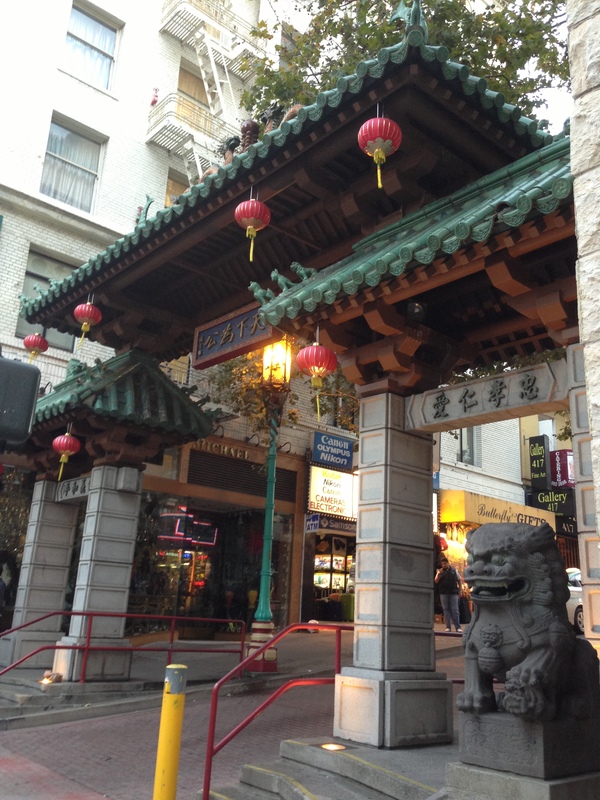 Another thing that REALLY surprised me was that actually Cantonese is more useful than Mandarin – before my husband used to study in LA and he told me that every year Mandarin got more and more useful in LA’s Chinatown, restaurants or any other places with Chinese people. And finally yesterday almost everyone next to me was speaking in Cantonese, someone let Samuel H ui sing in the backgroud… As someone who tries to speak Cantonese this really makes me happy. I was so happy that I even look for those tiny food-stands with smelly tofu and other snacks usually sold on the street. On the other hand you could buy so many cheap instant noodles you wouldn’t need to cook until next year’s festival. Too bad – we had a lot of Chinese-medicine shops, places when you can buy dry-everything you can use to cook. 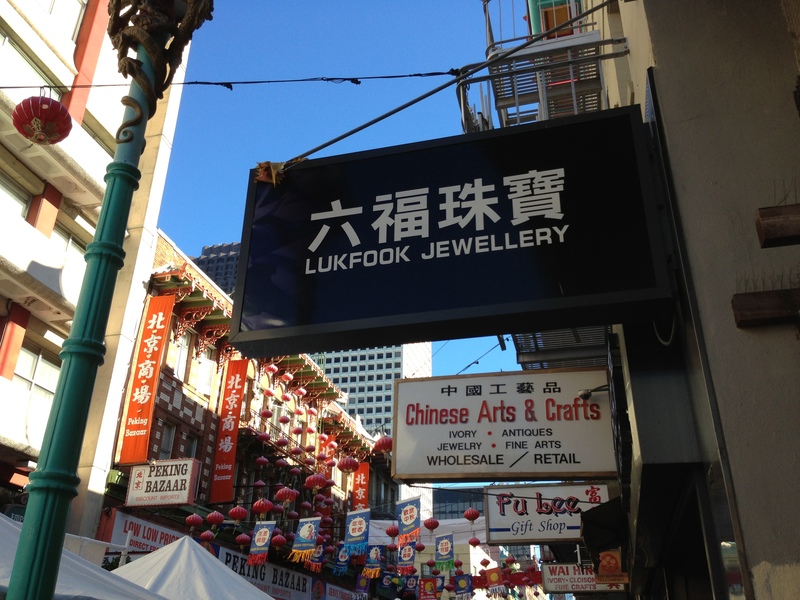 We even had a Luk Fook Jewellery shop. I only missed Chow Tai Fook to make it feel like tourist areas of Hong Kong. 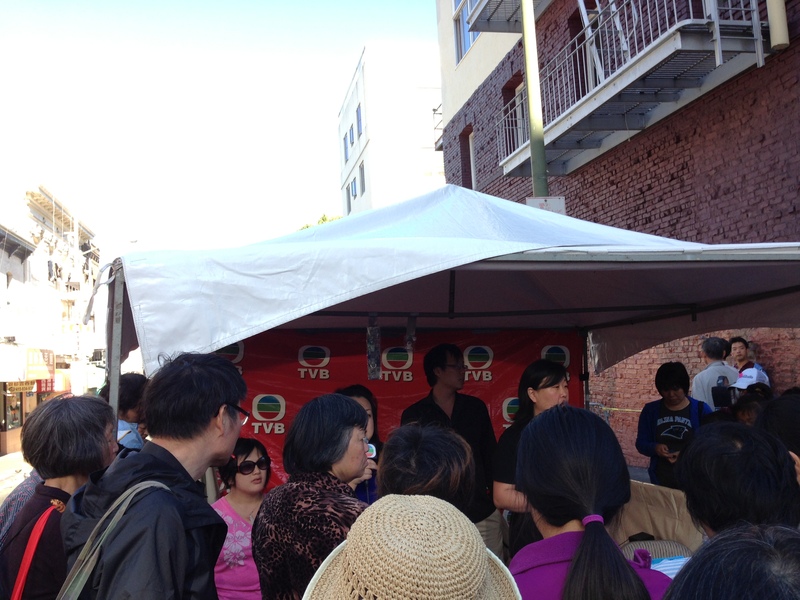 There was even a TVB-stand! For this who don’t know what is TVB, it’s a major TV station in Hong Kong. We didn’t have too much time to walk around since according to schedule (http://www.moonfestival.org/schedule.html) it ended up at 6PM and 5PM was a main point we went there. 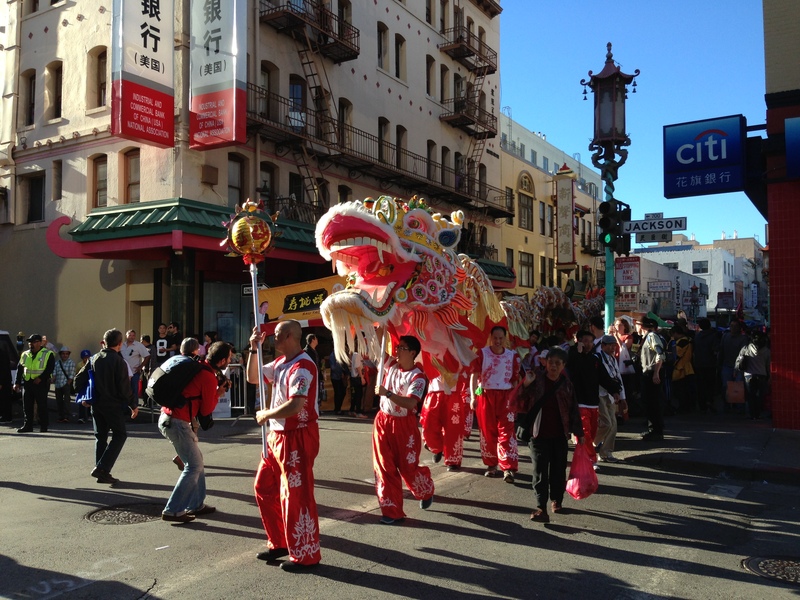 Yup, I wanted to see my first live White Crane Dragon Parade. I almost got a heart attack when I heard some people saying ‘There will be no parade’. As you can see I’m still alive and they had actual tiny parade. Since any fireworks are quite forbidden they couldn’t run with firecrackers in front of the dragon but it was still really fun, I even told my husband I want our child to be the dragon’s head. Check it yourself, if your Internet is fast enough change quality to HD. Loud, loud, loud and amazing. Honestly I cannot wait to see how it will look on Chinese New Year. From all those emotions we got hungry. 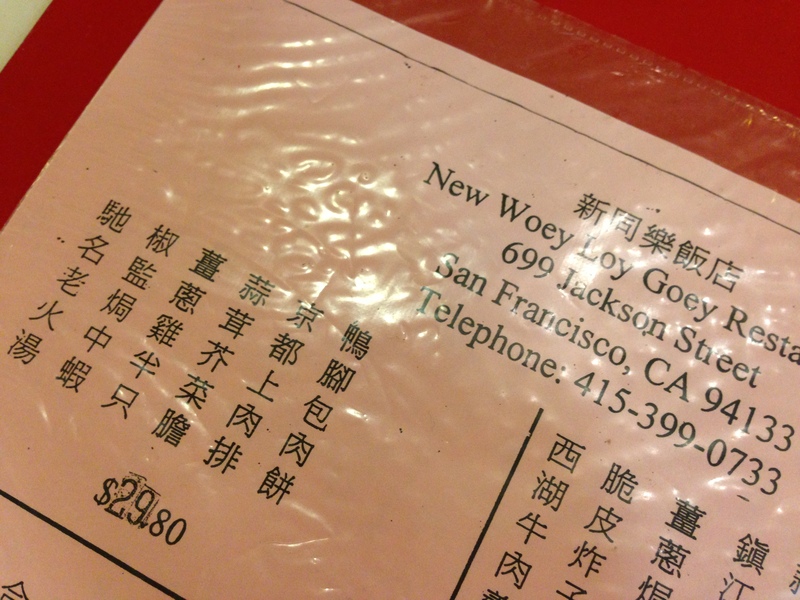 We had a problem to chose between Hong Kong Clay Pot Restaurant and New Woey Loy Goey. Both of them had good reviews on yelp.com and were literally at the same corner. Walking from one to another 84358373 times we decided to go to the second one. Why? Not because we couldn’t say out loud the name, it’s because of ‘Secret Chinese Menu’. Don’t worry, it’s not a ninja whispering what he wants and disappearing in the crowd with his meal. Many restaurants have two different menus – one for ‘white people’ with all those sweat and sour chickens and other things that would probably suit tourist’s taste and menu completly in Chinese, for ‘locals’. If I went alone I would probably order some standard noodle soup, but good I had my husband – we took a set that include: garlic veggie, pork bone soup, fried shrimps, chicken, steamed minced meat and something with pork that was tasting little bit sweet, but I cannot really tell what was that. 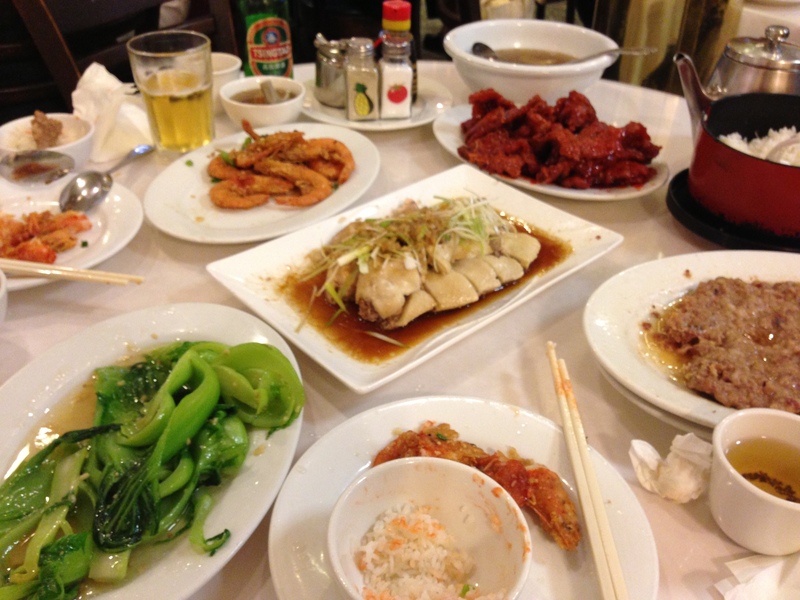 Most of the items were typical Cantonese cuisine. You also get a tea, but rice is not included – even if you want want to eat it, they count it per head, but it’s so cheap it’s not really a big deal. We also got a beer for my husband since finally he didn’t need to drive. Now guess how much that huge meal was? Set by itself was just 29.80 + tax. Can you believe that? It was so cheap and much more than we could eat, still having it at home for today’s meal! With tips, tax etc. we paid 44 USD. My inside cheapness is crying from hapiness. And service was so nice. Also I could ‘speak’ a little bit with my ‘thank you’ and ‘no’ in Cantonese. Let’s say I made a little bit of a progress willing to speak to someone else than my husband. 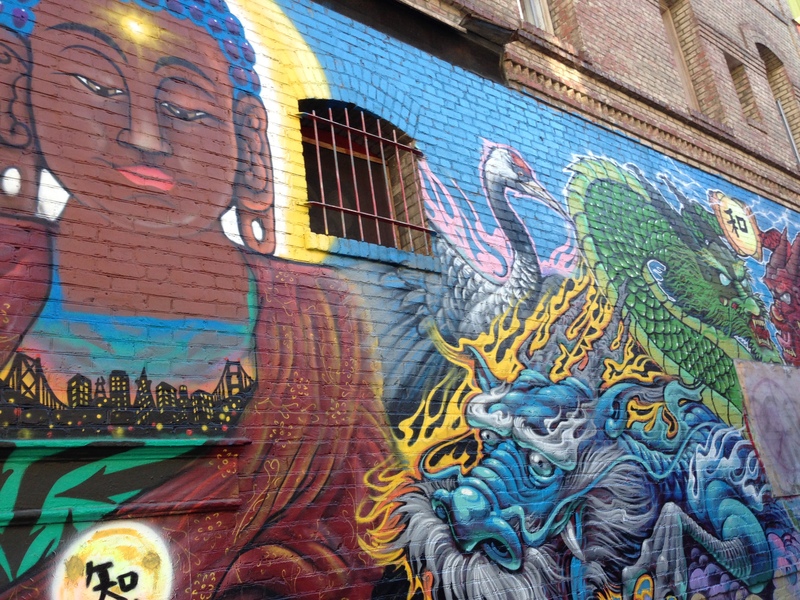 If you visit Chinatown just go there, you won’t regret. 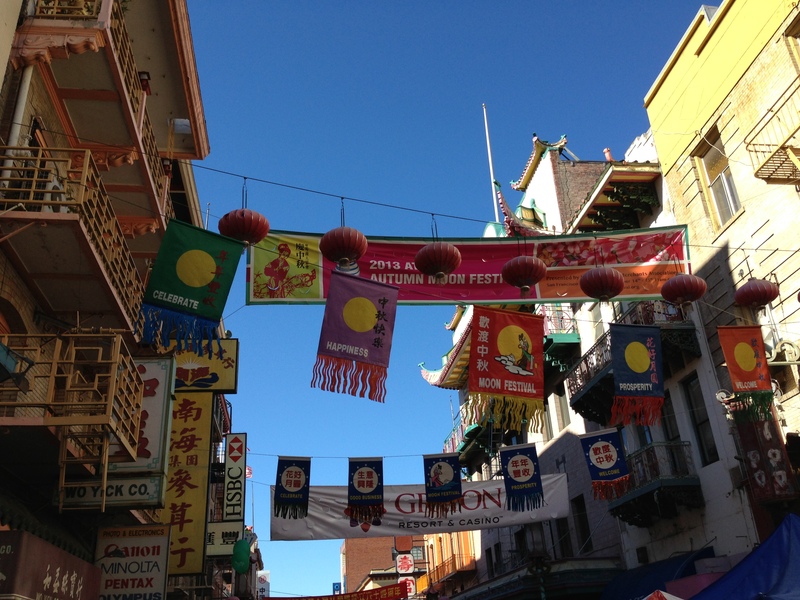 I’m in Chicago and missed our Chinatown celebration last Sunday because it was pouring rain. I’ve already bought a box of mooncakes for my kids, but they ate them weeks ago. I’ll buy another box and will hang some lanterns. It’s my favorite Chinese holiday, and I wish I could do more for it! i Live in Toronto we do have some super cheap Chinese food here hahaaa! Getting ready for it here in Taiwan. Mooncakes are everywhere in my office, and I’m looking forward to a long weekend with 4 days of bbq and firecrackers in Kaohsiung! Wow! It looks like an awesome celebration!! Glad you got to enjoy it!!! I have been invited to several barbeques this weekend and I can’t wait to have 4 days off!! Fingers crossed that there are some ice-cream mooncakes around this year! I received some last year and they were amazing!! 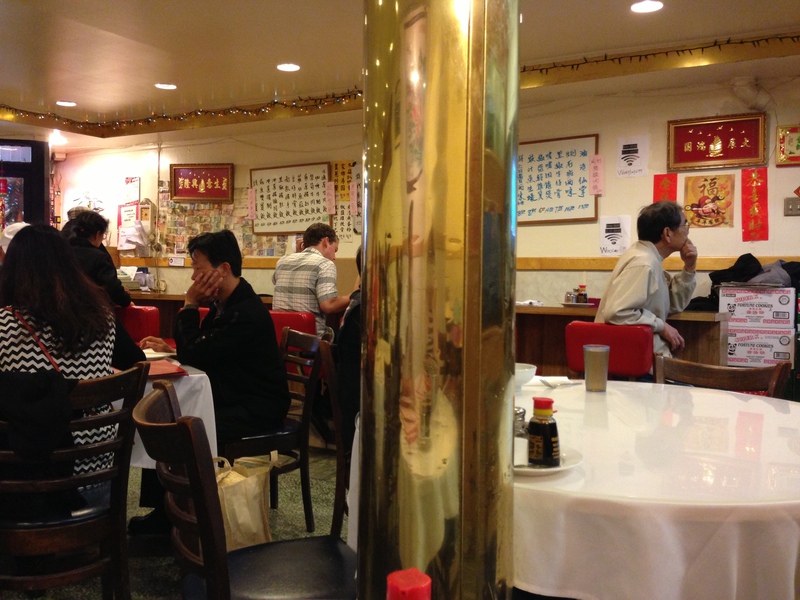 I miss Houston’s Chinatown. 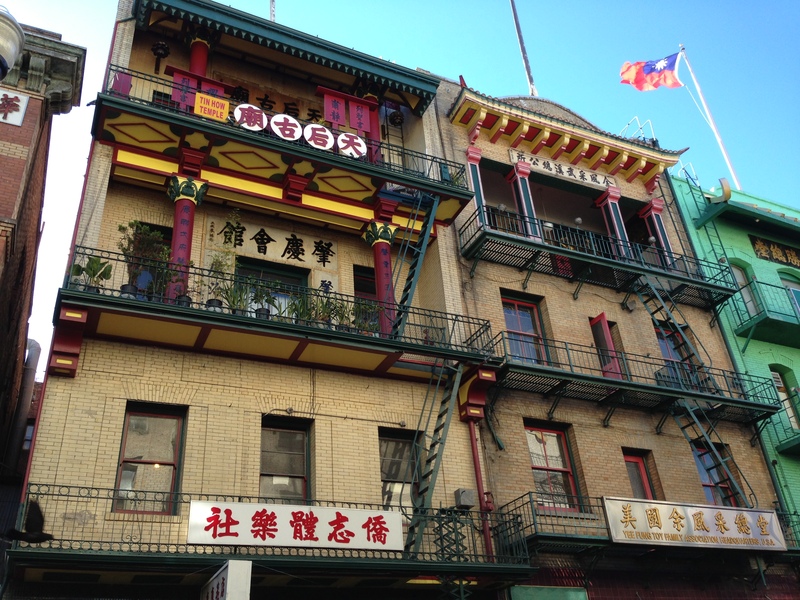 Due to the size of that city, there are actually pockets of Chinatown all over. I can’t believe I actually left that city. Thanks for liking my Liebster Award post! 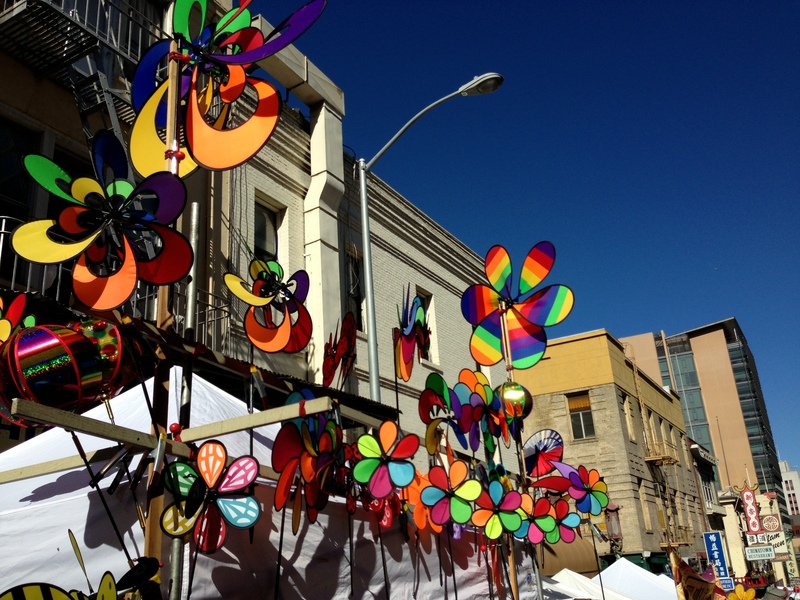 Well, as it is in NY’s Chinatown, the older you are, the more likely it is that you speak Cantonese as a first language. In fact, I was berated a couple of times for using Chinese, so I think next time I’ll just switch to Chaozhouhua…and the four phrases that I know. 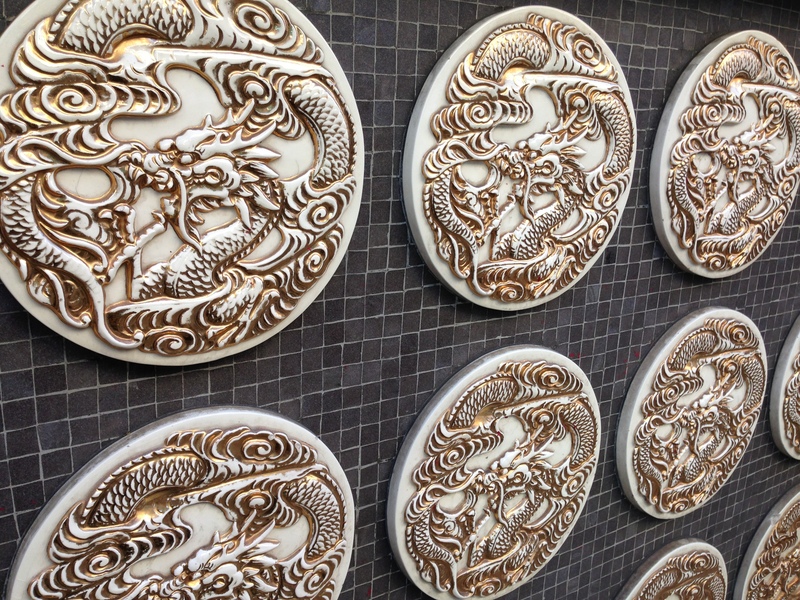 Have you checked out Japan’s Chinatowns? Way too clean. That’s how you know they’re phonies! Good 包子 though. Also, since you mentioned Sam Hui, a lot of my Shenzhen students used to mention a couple of refrains from his songs. Approve your attitude about transcutural consciousness. We need to remember something belongs to ourselves, not just be changed gradually. I’m an SF native and glad you had fun here over the past weekend.. The reason why you heard so much Cantonese is that: SF’s population of Chinese immigrants has historically and are still mostly from Guangdong.with a large majority from Taishan. That dates back to the mid-1800s. Although I hear more Mandarin being spoken in SF over the years, Cantonese and Taishanese are still the dominant dialects spoken in SF, I grew up speaking Taishanese which I feel is analogous to a heavy drawl spoken by Americans in the deep south.when compared to Cantonese. Unfortunately I can’t understand any Mandarin at all.